The circular saw is the workhorse saw for many DIYers. They are easy to handle and perfect for making quick, accurate cuts. When it comes to getting the most from this versatile tool, you are obviously going to want to follow the best tips for using a circular saw. Beyond that, you are also going to need to know how to use the right circular saw blade for the task at hand. In this post, we are going to look at different types of circular saw blades and the types of work you can do with them. Those include the framing blade, metal cutting circular saw blade, ripping blade, finishing blade, and masonry blade. Of course, you’ll also want to be sure to get the right size circular saw blade. Before you can choose the best circular saw blade for the job, you need to consider the size of the blade. Circular saws are classified by blade size, and you have to make sure to get a blade that is the right size for your circular saw. The most common sizes are those that range from 6” to 7-1/4”. A model like the WORX ExacTrack 6-1/2” Circular Saw would fit in this range. 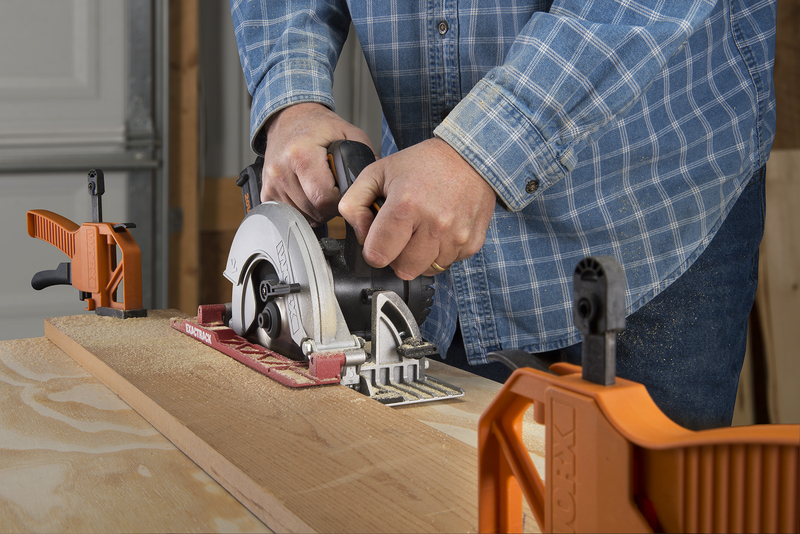 However, if you are using something like the 4-1/2” WORXSAW Compact Circular Saw, you would need to go with a 4-1/2” saw blade instead of the 6-1/2” blade that fits on the larger circular saw. The 24-tooth framing blade is one of the most commonly used circular saw blades, and it is the one that is included with most circular saws. This blade is ideal for rough cuts that value speed over cleanliness. It can work on framing lumber and plywood and make rip-cuts and cross-cuts. While it is a versatile blade that makes fast cuts, a circular saw blade for framing is likely to cause some splintering on cross-cuts and when cutting sheet materials. For that reason, it is not the type of circular saw blade you would want to use for materials that need a clean finish. Beyond cutting wood, you can also use your circular saw blade for cutting metals. That said, you will need to select the right metal cutting circular saw blade. Just because a blade is good for cutting stainless steel, it does not necessarily mean that it is good for materials like copper or aluminum. Furthermore, you need to consider the tooth-count when selecting a metal cutting circular saw blade. In general, you are going to want to look for more teeth when cutting thin sheets of metal and fewer teeth when cutting something thicker. That’s because a higher number of teeth produces a smoother cut, while metal cutting circular saw blades with fewer teeth will cut faster and more aggressively. While a table saw is probably the better tool for ripping wood, it can be done with a circular saw. If you are going to rip boards with your circular saw, an 18-tooth ripping blade will make the work quick and easy. Most ripping blades have fewer teeth with deeper gullets. This helps the circular saw blade to cut with the grain while also moving the cut material out of the way. If you need a clean cut when working with plywood or other sheet materials, you are going to want to look for a blade with a higher tooth count and a less aggressive tooth design. These blades will help you avoid splintering on materials that need to look good on the finished product. For this type of cutting, you would need to go with a blade that is at least 40T, but you could get cuts that are even cleaner with blades that have 60, 80 or 100 teeth. With a diamond circular saw blade, you can cut materials like stone, tile, brick, and concrete. If you need to cut tile for the floor or cut paver stones for an outdoor project, this type of circular saw blade will provide precision cuts with relative ease. While diamond blades can be great for masonry projects, it is important to note that not all diamond circular saw blades are the same. Some are designed to be a little more aggressive while not cutting as cleanly. Along with that, some are meant for dry cutting or wet cutting, and there are also diamond blades that can do both. That’s why it’s important to do your research and know what your project will require. When it comes to finding the best circular saw blade, it is all about the material you need to cut and the result you are looking to achieve. With a circular saw, a good set of blades and a little know-how, you can complete any number of DIY projects around your house. Find the best circular saw and circular saw blades at WORX! The different types of circular saw blades include the framing blade, metal cutting circular saw blade, ripping blade, finishing blade, and masonry blade.